It’s no secret that our four-legged friends are as much a member of the family as anyone else. 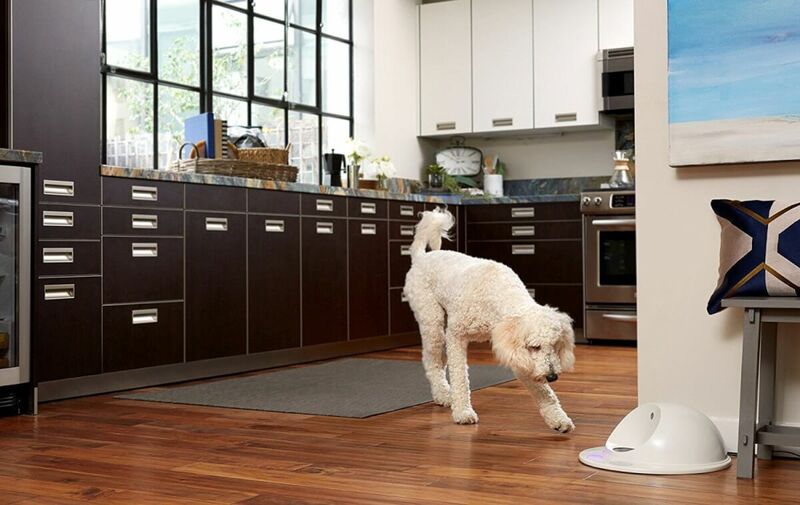 So when it comes to keeping them well-fed and happy, many pet owners are buying smart pet feeders to give love and treats during a busy weekend agenda or late-nights at the office. 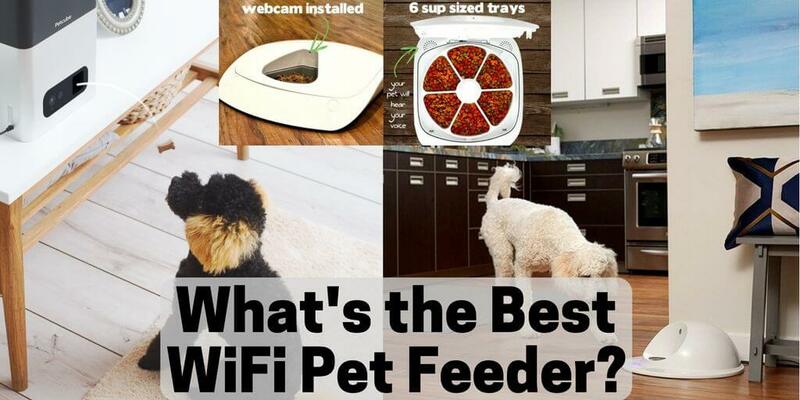 But how can you choose the best WiFi pet feeder for your dog or cat? It all starts with considering the biggest challenges you have with feeding your pet when away from home. 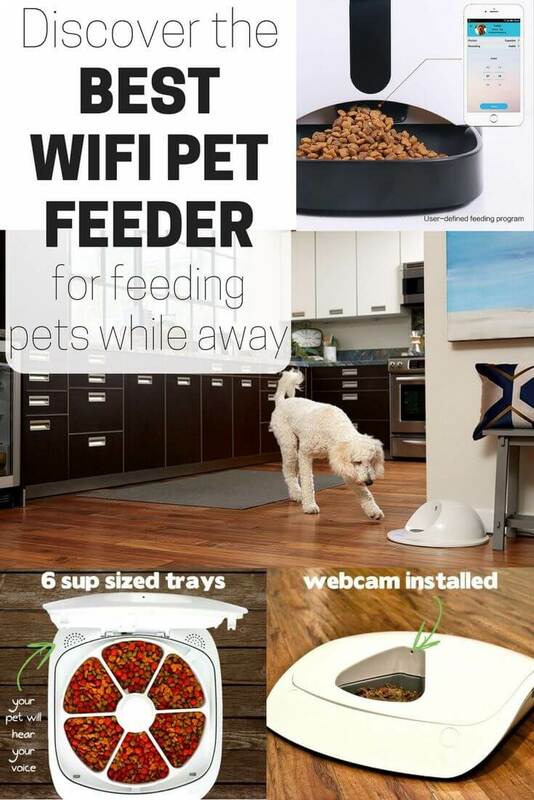 Here are a few of what we consider to be the best WiFi pet feeder options for serving up your pet’s dinner, even when you’re gone. Before we dive in, let it be noted that most WiFi pet feeders have app access, wireless cameras, the ability to talk to your pet, and automatic feeding options. If a feeder listed here is missing one of these components, or has other impressive features, we’ll be sure to point them out! 0.0.1 Challenge 1: I want to control feeding schedules. 0.0.2 Challenge 2: I need to feed my pet wet food. 0.0.3 Challenge 3: My dog or cat gets bored easily. Challenge 1: I want to control feeding schedules. This may seem like the most obvious need when choosing the best WiFi pet feeder. The simplistic gravity-fed feeders that offer up an endless stream of kibble may result in Fido eating his breakfast, lunch, and dinner all in one sitting. To solve this dilemma, WiFi pet feeders found in smart homes of the 21st century have built-in technology that dispenses a pre-determined amount of food on a schedule set by you. For instance, you may regularly leave for the office by 6 a.m., but want to feed your dog or cat a cup of kibble at 8. The feeder will automatically serve up the tasty morsels right on time, and in just the right amount. Most are ‘silo-style,’ so you can store food for several days in the feeder. 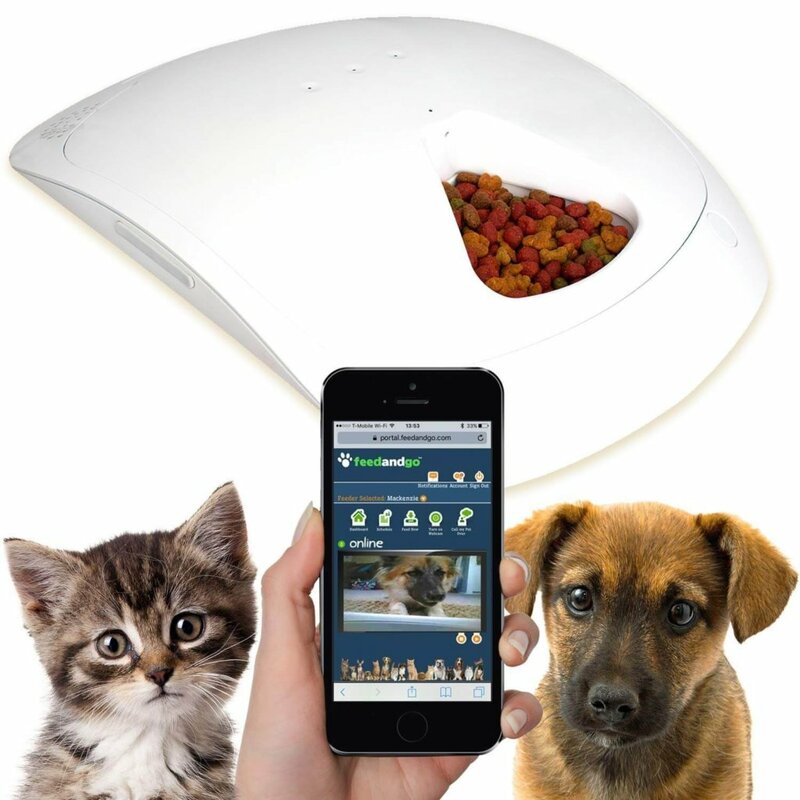 Best WiFi pet feeder in this category: GemPet Smart Feeder. 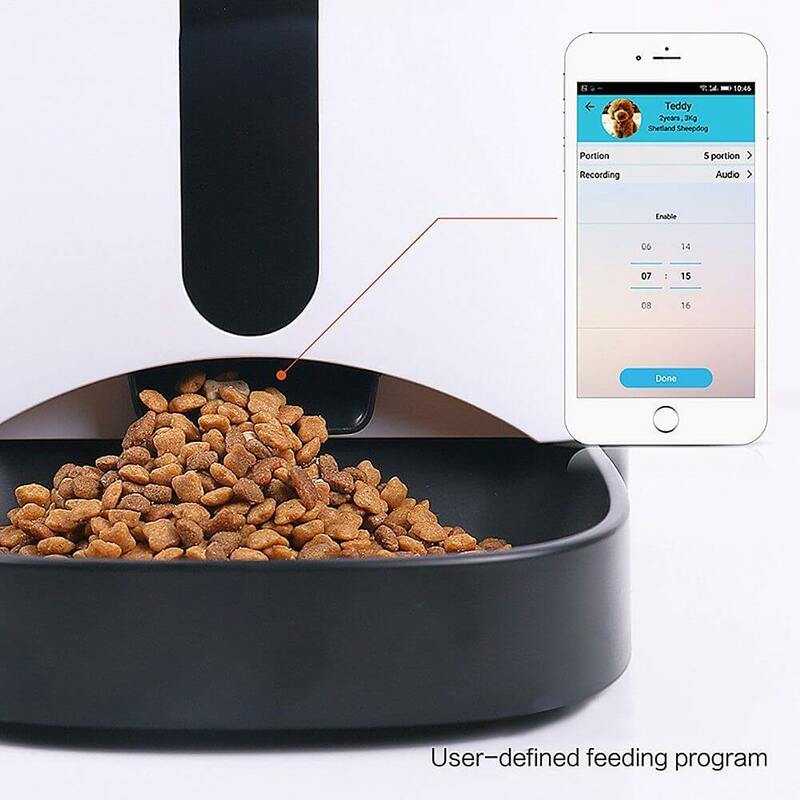 This dispenses anywhere from 10 grams to 100 grams of food per meal, and with app access and a camera, you can take a peek at your pet as they grab a snack. Meals can be pre-scheduled, or you can feed your pet ‘on-demand’ using the app. But if the WiFi connection is lost, your pet won’t have to go without their next meal. The unit will switch to offline mode and will feed according to the pre-determined schedule you’ve input. Challenge 2: I need to feed my pet wet food. If your feline friend or canine companion is used to a diet of wet food, then the field for the best WiFi pet feeder narrows considerably. However, there are still some great options available! For obvious reasons, a silo-style feeder is not an option for pets that eat wet food. To be successful, an automatic pet feeder would need to have a tray or bowl construction, with a lid that slides out of the way at feeding times. 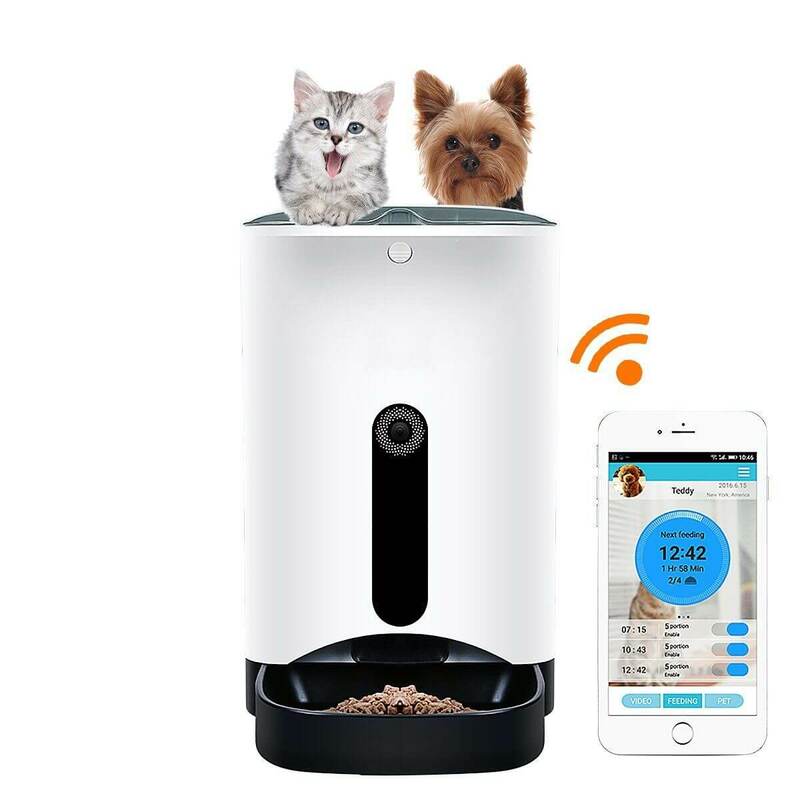 Best WiFi pet feeder in this category: Feed & Go. The Feed and Go Automatic Pet Feeder is a low-profile unit that comes in glossy white and has a streamlined look. But if you open up the pet-proof lid, you’ll find 6 compartments capable of holding up to 8 ounces of food each. It’s designed to accommodate wet food. Using the app from your smartphone, set up a feeding schedule or dispense a meal on-demand. 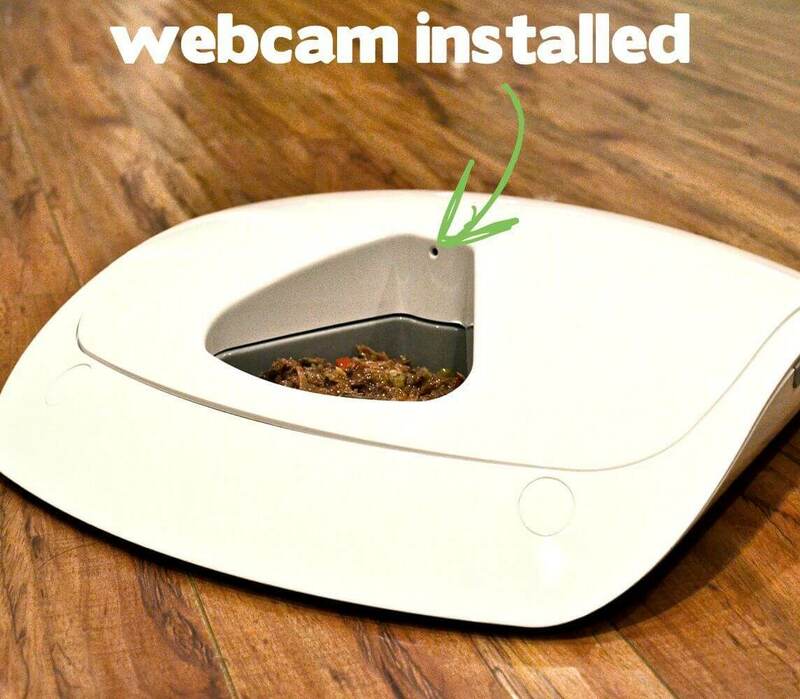 The wireless camera and built-in speakers allow you to call your pet over, and get a glimpse as he or she enjoys the meal. And the unit will send you optional text messages or emails to alert you when a meal is about to be dispensed, when your pet is eating – or both! With 6 compartments, you can easily include treats to brighten up your pet’s day. Or if you have a pet with special health needs, it is also easy to include medication in a designated compartment. While this unit is at a higher price point in the WiFi pet feeder category, the great features and ability to dispense wet food and medications make it an attractive option. Challenge 3: My dog or cat gets bored easily. If your pet has endless energy, there are WiFi pet feeders that promise to keep them both well-fed and entertained. Some allow for two-way treat time using a wireless camera and speakers, while others use lights to engage your pet in a quest for food while you are away. These pet feeders can be used to dispense treats or give your pet a full meal. They also can slow down eaters who are in a rush, eliminating the chance for bloating or vomiting. Best WiFi pet feeder in this category: We have two top picks, depending on your objective. If you’re looking for hands-off entertainment for your pet while you’re away, the CleverPet Hub promises to keep your pet challenged forever. The feeder uses lights to encourage your pet to touch certain spots on the hub. When your pet complies, the feeder opens and releases food. It takes the guesswork out of training, and users report that the unit engages the pet and gradually teaches them the connection between the lights and the tasty morsels inside. It is an expensive unit, but with app access, statistics, and the ability to keep your pet mentally engaged, it may be the perfect buy if your pet needs to be occupied. If you want interactive treat time with your furry friend, check out the PetCube Bites – not yet released, but coming soon! This slim unit can sit on a table or mount to the wall. Using WiFi, a wireless camera, and app access, you can talk to your pet and once you have their attention, toss them a treat from the unit! Or, you can schedule the unit to dispense a treat at specific times throughout the day. 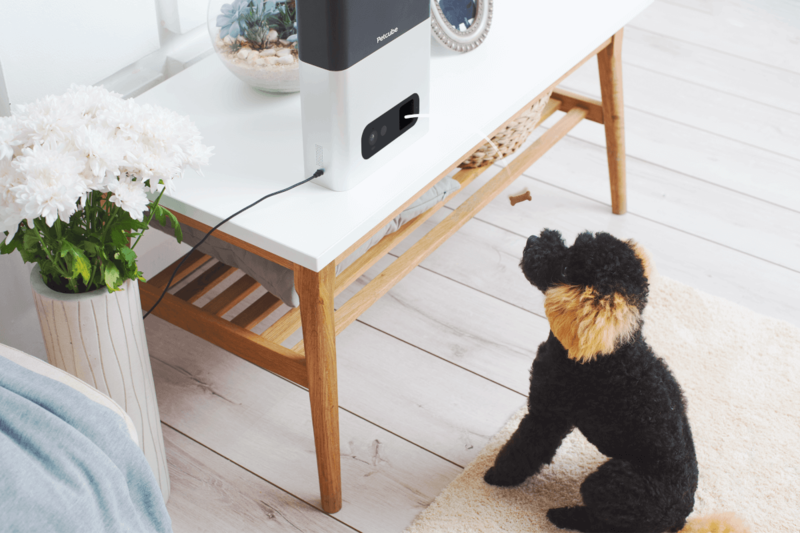 The unit also allows for night vision, supports HD video, and stores 10 or 30 days of video through PetCube Care (the brand’s app for all its products). It is also compatible with the original PetCube, which has a built-in laser for playtime. Our choice for best WiFi pet feeder would have to be the Feed and Go Automatic Pet Feeder. The slim profile, ability to store multiple meals for wet and dry food, and provide treats or medications make this a versatile unit. And it isn’t short on technology, either – a wireless camera, the ability to talk to your pet, and an app control center make this a great addition to your smart home! The excellent Amazon reviews also push Feed and Go over its competition. Have you tried a WiFi pet feeder as a solution to keeping your pet’s meal schedule? Share your experience below!